Tripp Lite single phase Metered PDU / Power Distribution Units offer real-time local reporting of load level in amps via built-in digital display. Enables visual monitoring of PDU load levels to prevent overloads as additional equipment is added. Offers reliable rackmount multi-outlet power distribution from any protected UPS, generator or mains input power source. High quality design includes rugged all-metal housing and secure rackmount installation with included mounting accessories. Efficiently distribute and monitor power with Tripp Lite's PDUMV20-24 Single-Phase Metered Power Distribution Unit. It has a digital meter to provide the real-time current draw of connected equipment, allowing you to avoid overloading the PDU as devices are added. Unfiltered electrical pass-through makes the PDUMV20-24 ideal for distributing alternate waveform utility, UPS or generator power in rack enclosures and network closets. This PDU is 24 inches long and mounts vertically to your rack. The PDUMV20-24 provides reliable 120V power via six NEMA 5-15/20R outlets. It has a rugged all-metal housing and a 15 ft. power cord with a NEMA L5-20P plug and 5-20P adapter. This PDU also has a 20A circuit breaker and a lighted power switch inside a transparent protective cover. Load capacity is 1.9 kW. The PDUMV20-24 is easy to integrate with a wide range of data center and network applications. It can be configured for 0U (vertical) rack installation with the included mounting brackets, and it also supports toolless button-mount vertical installation in compatible rack enclosures. Vertical 0U installation reduces cord clutter and promotes efficient airflow through the rack. A two-digit lighted load meter provides the real-time load level (in amps) of connected equipment. The meter helps you use the PDU at maximum capacity without danger of overload. The PDUMV20-24 comes backed by a 2-year warranty. It’s manufactured in compliance with strict RoHS specifications, reflecting Tripp Lite’s commitment to environmental responsibility. Founded in 1922 in Chicago, Illinois, Tripp Lite is a leading manufacturer of products to power, connect, house and protect your equipment. From the largest data center to the smallest home office, Tripp Lite products keep your equipment running effectively and efficiently. 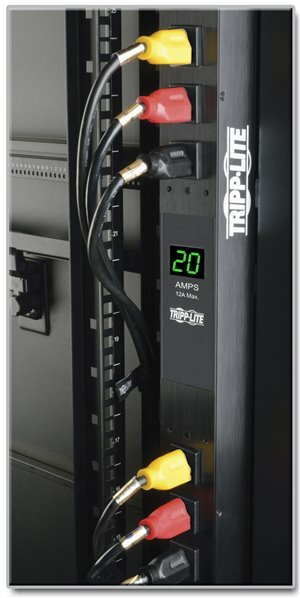 Whether you need to supply power to servers and have reliable battery backup, connect high-resolution video sources to displays and digital signs, or organize and secure IT equipment in rack enclosure cabinets, Tripp Lite has the complete solution. Plus, before and after your purchase, our Chicago-based, in-house technical support specialists are available to assist you by phone, email and live chat. With over 90 years of quality products and service, Tripp Lite is a brand you can trust.